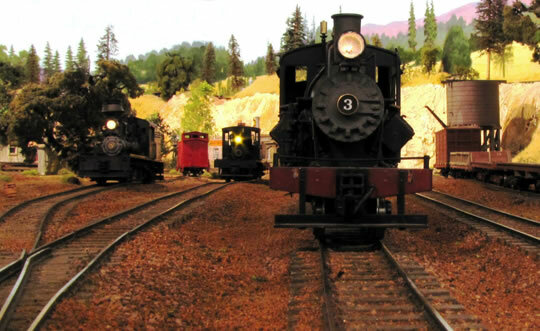 Old time logging railroad set in late 40’s in foothills and Sierra’s. Center point is Twain Harte – just north of Yosemite Park. 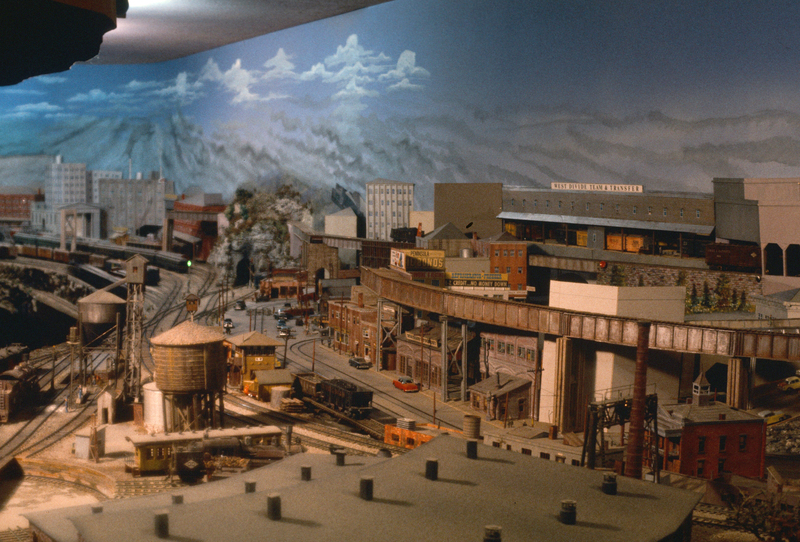 Layout is loosely based on the West Side Lumber and Pickering Lumber Companies. But also some inspiration from Mich Cal, Empire State Logging, and other logging companies in the Sierra’s near Sonora, CA. 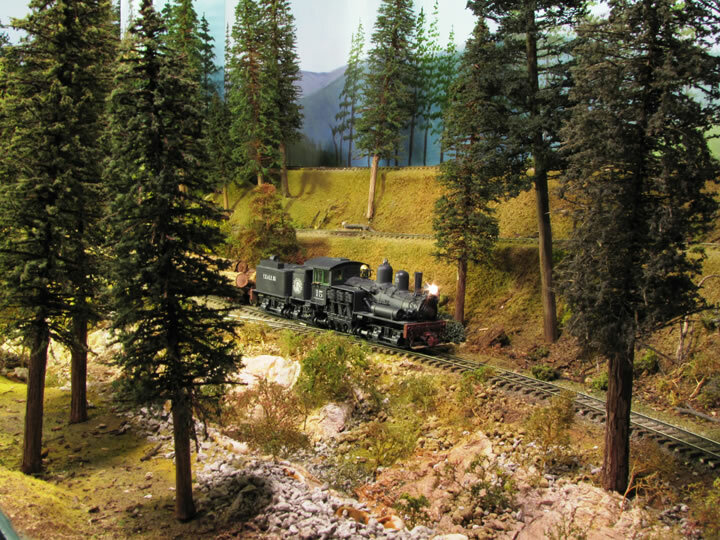 Narrow gauge of course – On3. Motive power it geared engines, Shay’s, Climax’s to Heisler’s many brass but also Bachmann locomotives. Sound and DCC is installed on all engines. 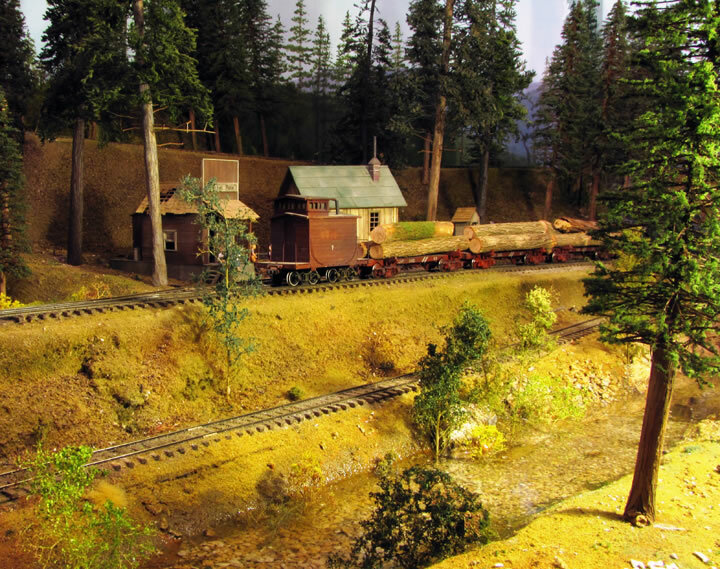 Scenery is complete – over 200 trees, many scratch built, structures are from kits to modified kits to scratch-built. Over 200 linear feet of track that is totally hand laid. 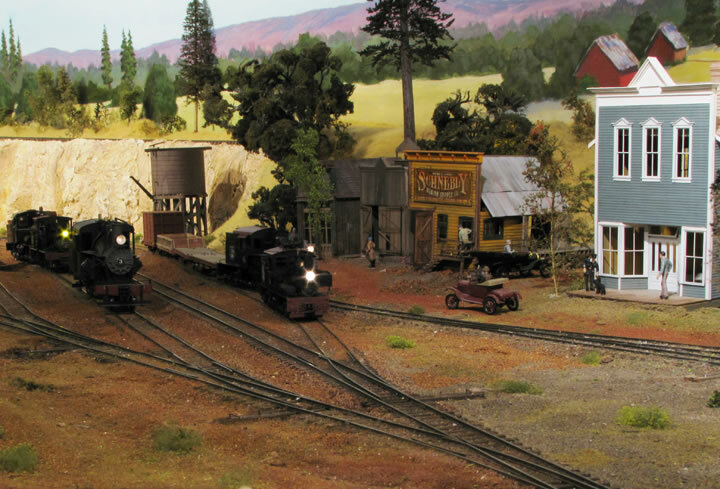 The layout is featured in the Nov-Dec 2010 issue of the Gazette. 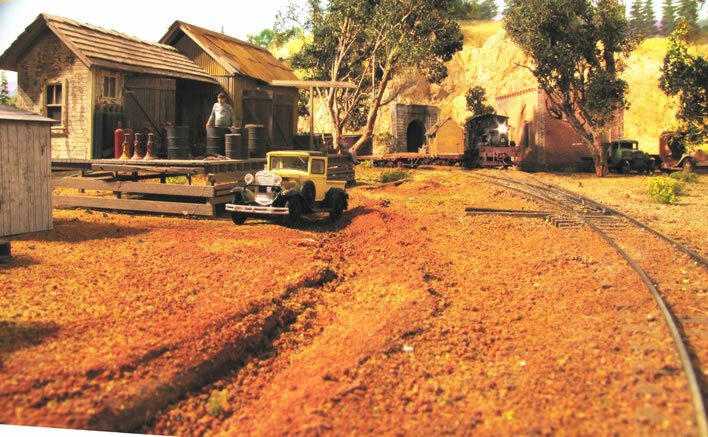 A picture of the layout is in the Sept-Oct issue of the Gazette. 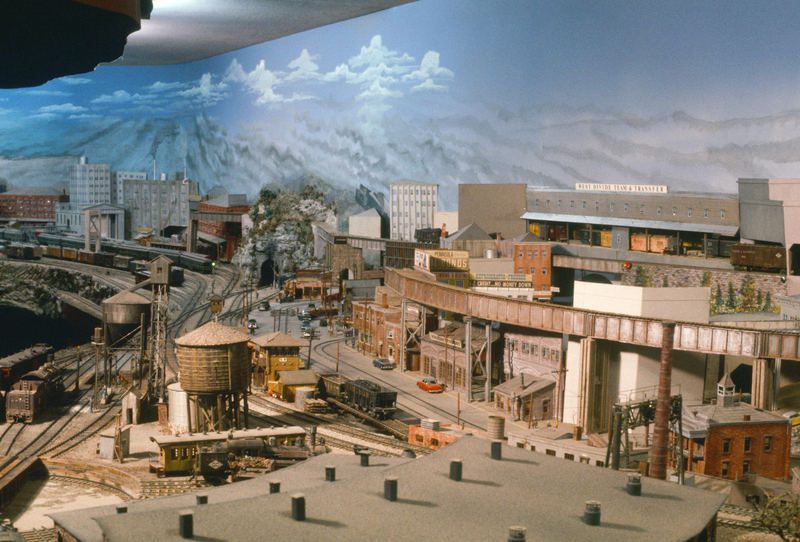 Complete backdrop painted by Dave Biondi. Layout is in a finished basement room. 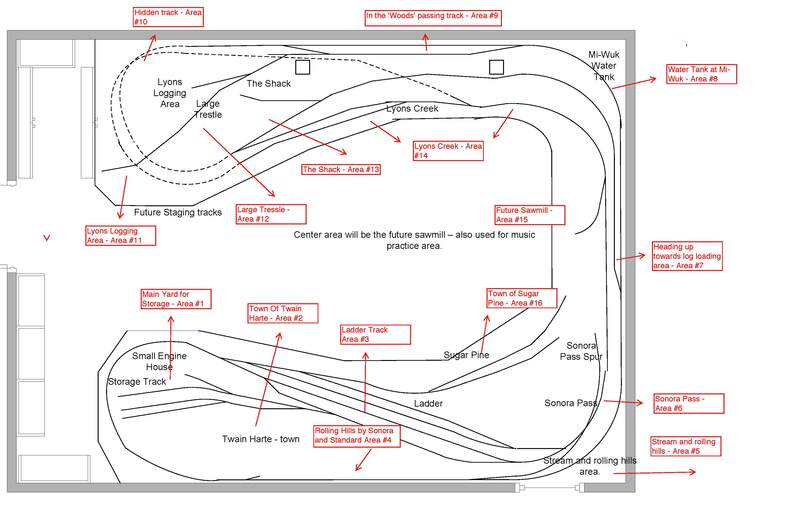 Go in the garage and the layout is in the back left. Room is 16' by 22' Layout fills most of the room. 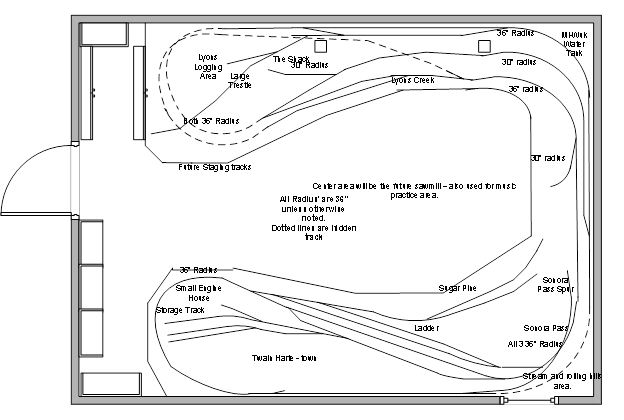 Below are overview pictures of the Layout! 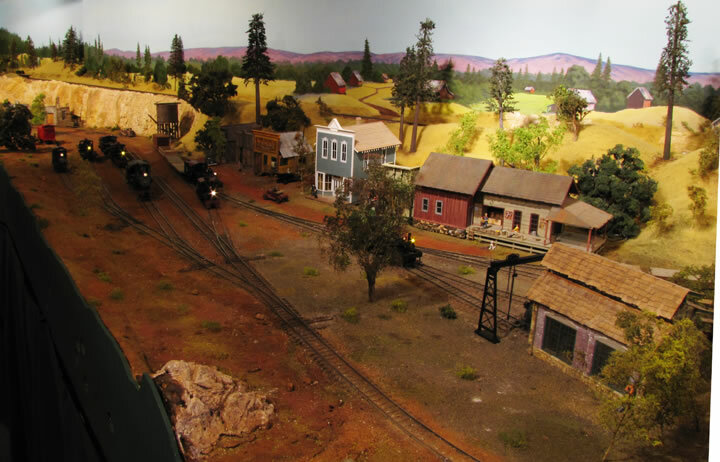 Notes on THSP railroad – Twain Harte and Sonora Pass RR and the following explanation may help you enjoy the layout more. 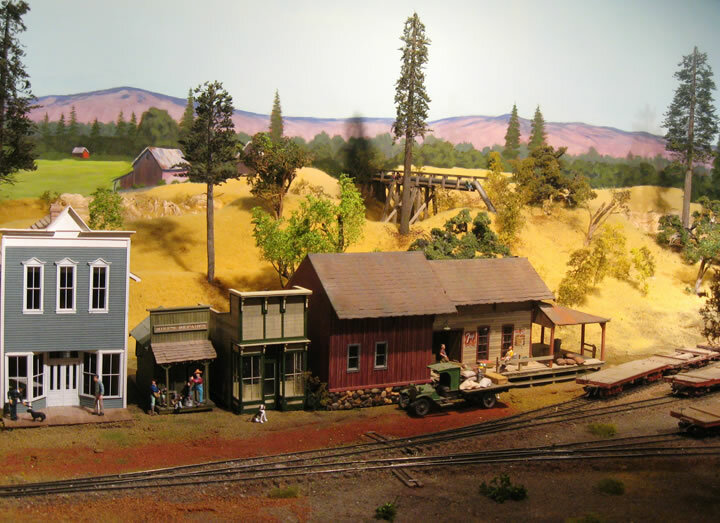 Layout is built by Frank Markovich, 1904 Chula Vista Drive, Belmont CA 94002. Email frank@frankmarkovich.com. 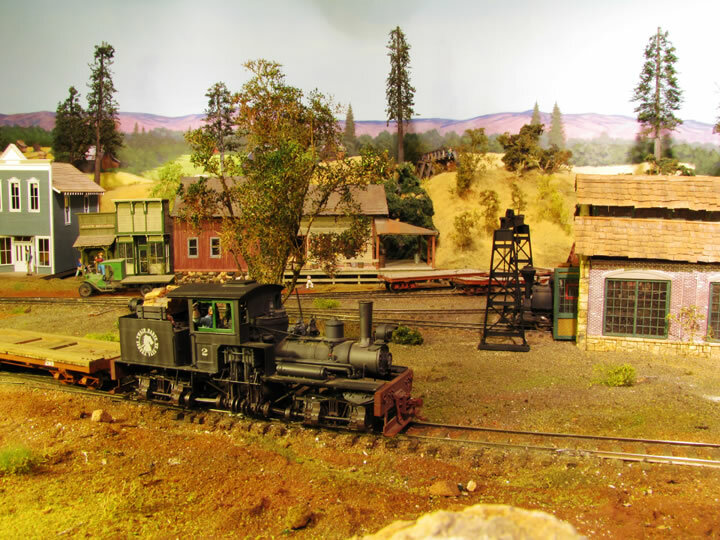 Logging railroad set in late 40’s in foothills and Sierra’s. Center point is Twain Harte – just north of Yosemite Park. 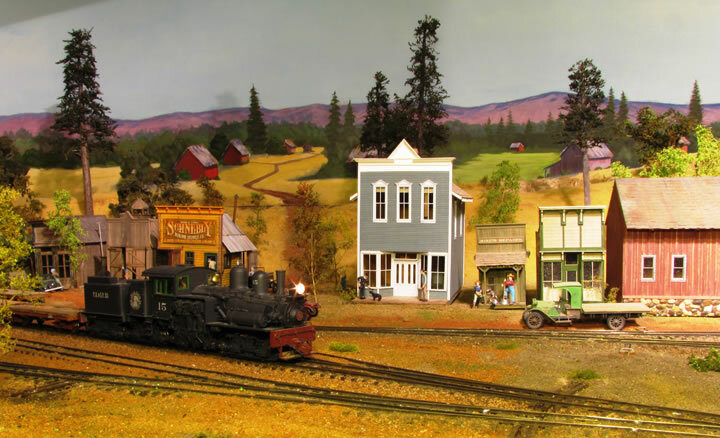 Railroad heads east towards Pinecrest Lake. 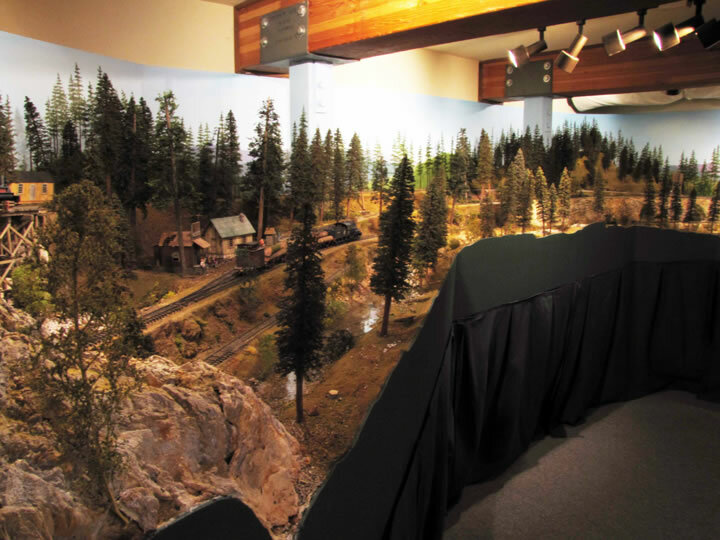 To represent what a logging line might have looked like in the Twain Harte area. 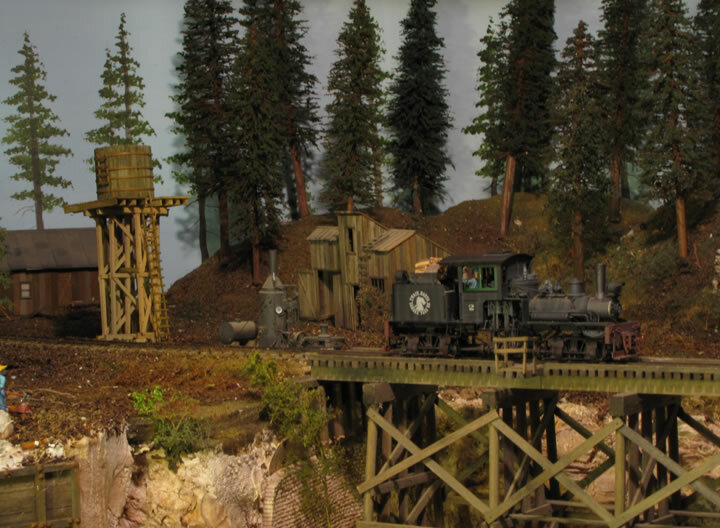 The railroad is based loosely on the West Side Lumber and Pickering Lumber Companies along with other logging railroads in the Sierra’s. Era modeled is late 40’s early 50’s, scale On3. 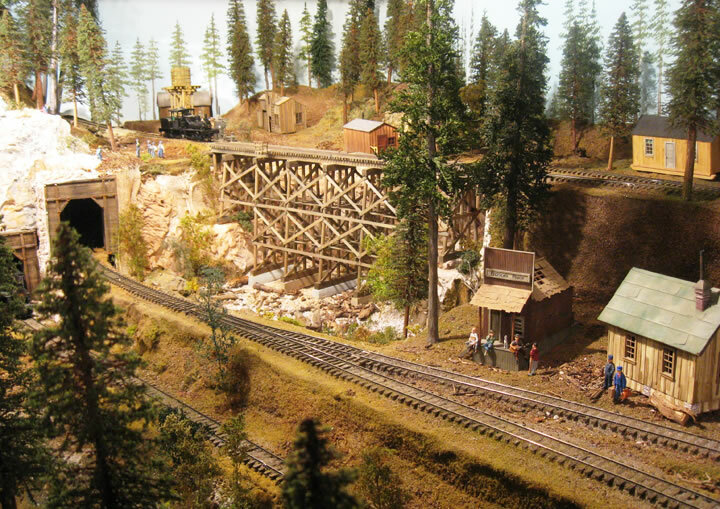 A place to run model trains on a scale model logging railroad. 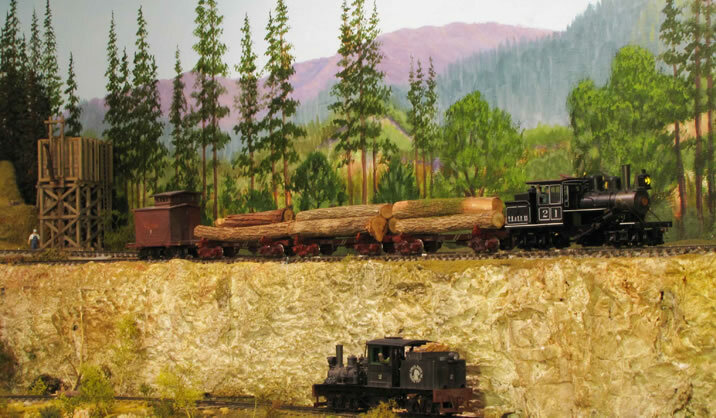 Logging railroad. 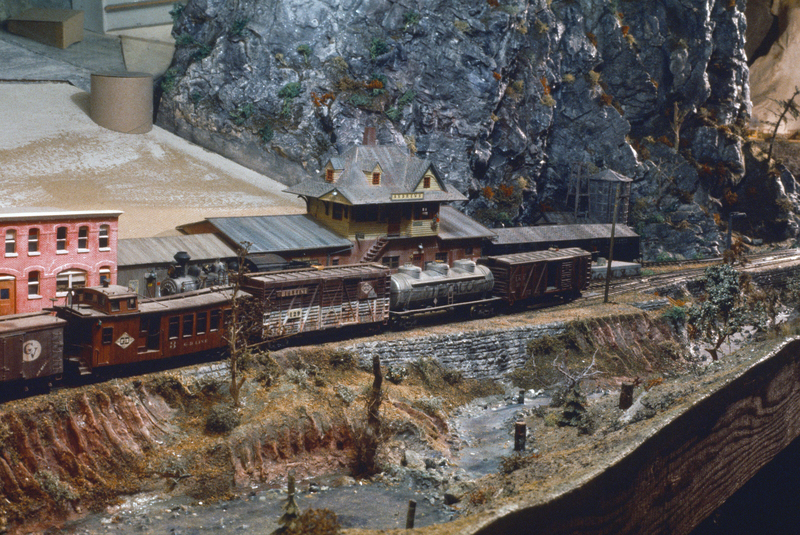 Mill with transfer really may just do all Narrow Gauge. Note mill to be added in the next 2 years – have started the planning. Passenger service. Also added in next 2 years. 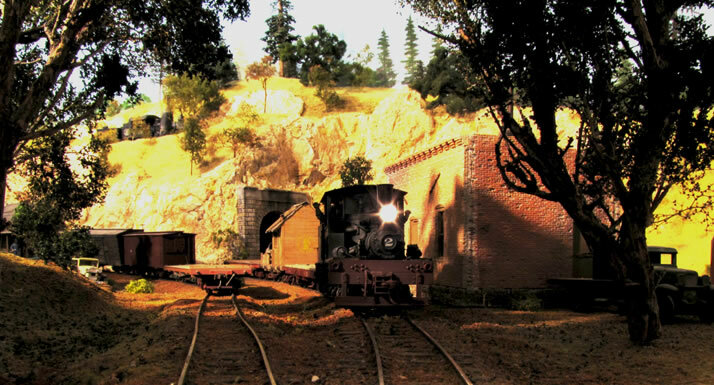 Freight service to bring goods into the town. Two towns – may be 2 names – dual service. 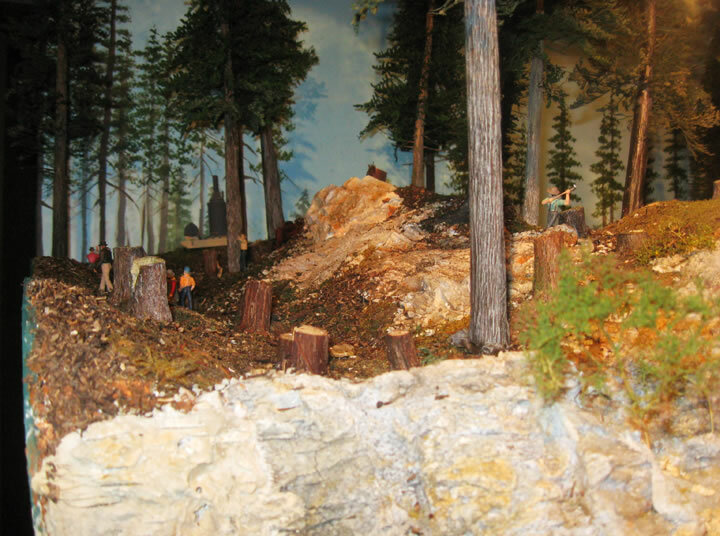 Mainly Ponderosa Pines, Sugar Pines and Fir trees. Mainly point to point but would want continuous operation. Layout mainly at or slightly below eye level. A large number of bridges and trestles – at least 4 – 1 – one so far. Mainly open grid - Exception maybe in yard area. Plaster Cloth covered in plaster castings or Bragdon resin. Have 40 to 50 foreground trees and 120 plus background trees, not counting trees on backdrop. Lots of stumps and lots of forest duff. Pine and Fir (mainly Ponderosa Pines)and for the town area – oak and other deciduous trees. Is mainly point to point but there is one large loop for continuous operation. Logging – load at spar tree and dump in log pond. 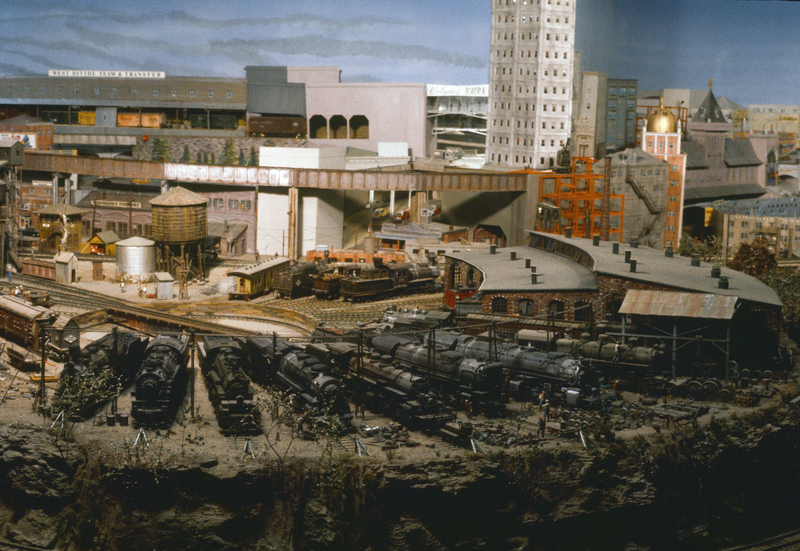 Industry – drop off and make trains for goods. DCC with sound installed for all locos. Operation should allow for 1 to 4 operators, but ability for single operator. Switches are 4 to 6 no sharper. Furthest to reach scenery 3 feet, topside Crawler is used for reach. Overall: Started by building the room. It has 2 uses – one is for the layout the other for a recording and teaching music studio – studio is mainly under the layout. Used an architect to do the drawings – had 40 yards dug out, bracing put in and concrete pad poured. I added in the framing the sheetrock, electrical, moved the plumbing, and textured the walls. I drew out the track plan myself after researching track plans of similar railroads. At the time I wanted to have point to point with the ability for continuous running. I decided on the height of the layout as I wanted it to be just below eye level on the whole. Bench work is mainly L Girder, with some plywood (yard area) and the rest with foam over the L girder. The track is all hand laid. Started with a jig for the ties, these were then applied over a roadbed of True Scale HO roadbed (good for On3) with plywood strips as sub-roadbed. Ties were first distressed and then stained with driftwood colored stain. Rail was laid (code 100) and spiked at each tie. Switches were also hand laid. Most of the ballast is dirt from the Twain Harte area sifted very fine. Plaster is applied to most of the top but some is just foam. Plaster etc. was first painted with an earth color (water based paint). 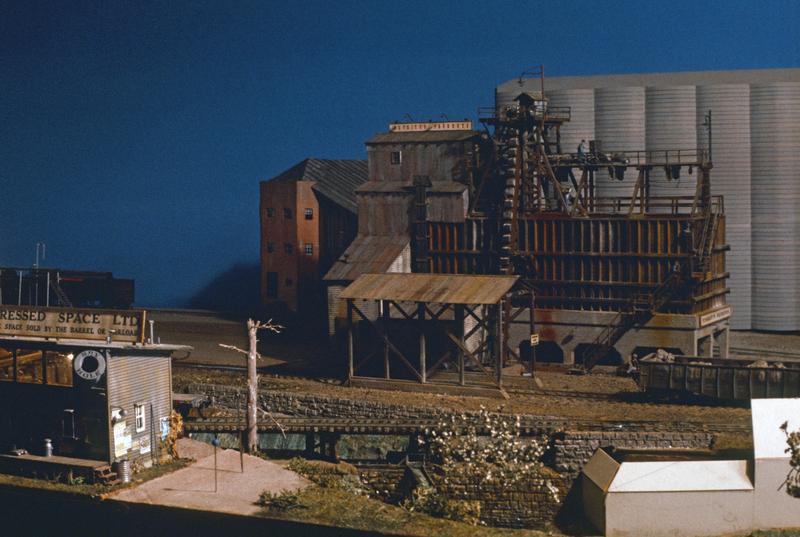 Once the track was in and the basic outline, scenery started in earnest. First was fine sifted dirt over almost everything. Then layers were built up. I marked where structures would go. Most are in the dirt. There are not quite there as they were just recently used for judging for Structure Award. They will be put in over the next couple of weeks. After the dirt then ground foam, ground moss, sticks etc. was applied and glued down with either white glue or carpenters glue. Rock molds were used for the rock work, some carving had to take place to blend them together. I used over 200 lbs. of plaster for the rock work. Once in place they were glued in with hot glue, or carpenters glue. 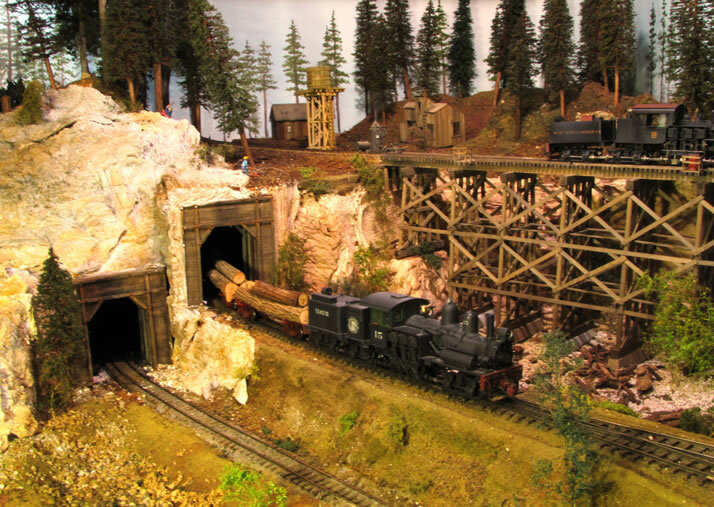 The tunnel portals were scratch built for the wood portals and commercial for the rock portals. The castings and cast portals were treated with various washes of both dyes and acrylics (very thinned down). Used all earth tones to color the castings, with a final wash of diluted India Ink and 99% alcohol to tie things in. 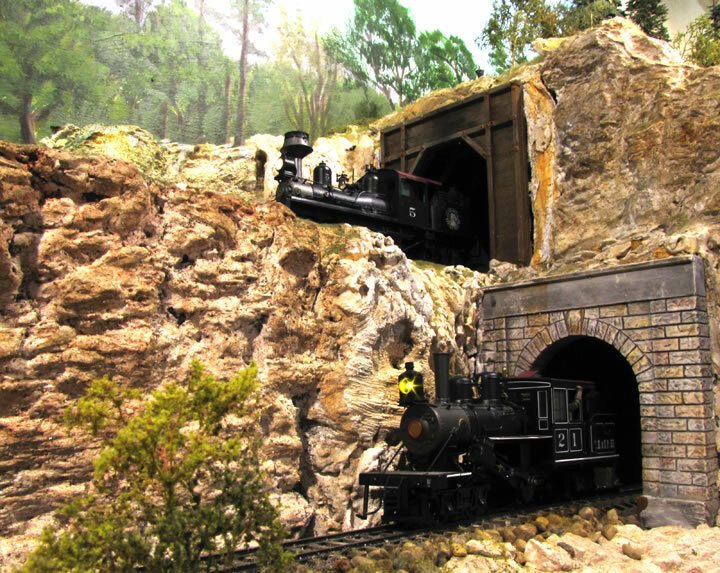 All tunnels also have liners that I scratch built. The castings on the back wall of the room were done with Bragdon’s foam method. This is very light but I do like the look of plaster better. Rock molds were mainly commercial but I also made about 1/3rd of the molds myself. Ground cover besides the dirt, is mainly ground foam from a large variety of sources including Woodland Scenics, AMS, Scenic Express and others. The wild grass was done with a Grass Master and flock. Started with using the glue from Scenic Express but most ended up being matte medium (for cost reasons). Road is red dirt from the Twain Harte area also. This is blended into the backdrop. 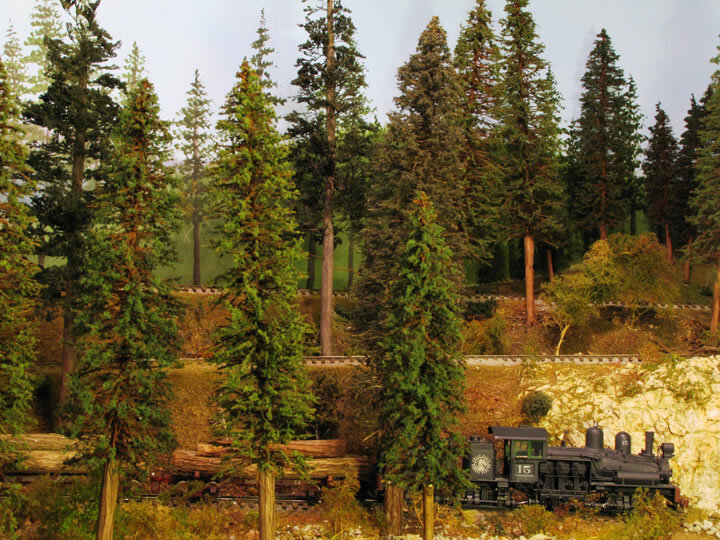 Lots of bushes and trees, most of the trees were scratch built by me. Some are cast (made molds) some just carved some trunks use the old Scenictarre tree structures. On those I put dry and painted caspia. Some are bottle brush type trees, some are Scenic Express Super Trees with flock added and there are 12 or so Oakey Dokey trees I purched. Lastly some are made from armatures of Sage Brush or dried plants I found. Water is Magic Water. I am not 100% done with that as one area still needs work. Lots of small rocks etc. in the river bed and along the river area. Backdrop started with painting the sky blue. I added in clouds then I sketched out what I wanted and Dave Biondi and I worked on implementing it. He did all of the hard painted and the two of us did sketches as to what was wanted. We matched the tree color on my trees to the backdrop. 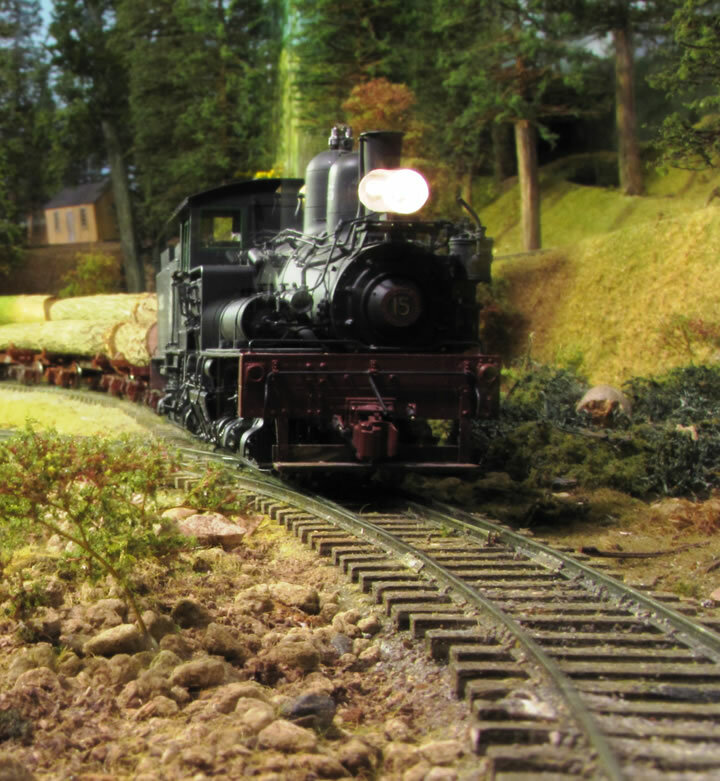 Lighting is track lighting that I put in before the layout was started. It is fully a daytime operation. At some point in the future I might add in an evening scene. Many of the buildings have Lights in them or will have lights. 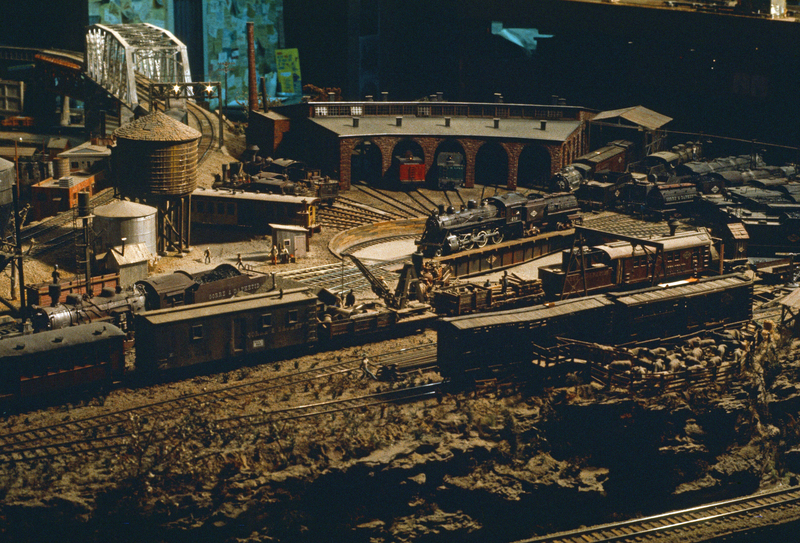 Since this is mainly a layout of a logging line, most of the work would have been done during daylight hours. Engines do have lighting. 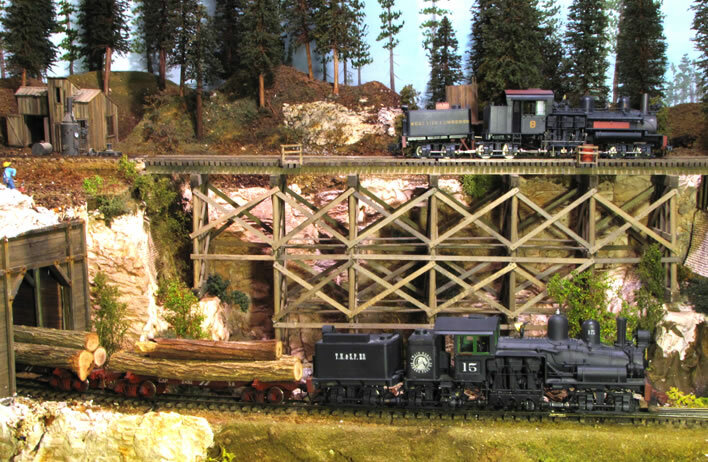 Structures are a variety of both kit and scratch built. 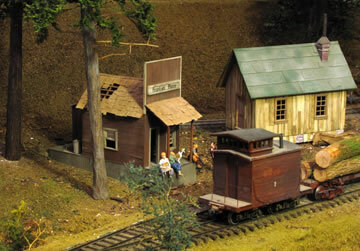 Have an engine house and water tanks, oil tank etc. to allow engines etc. to be serviced. See pictures for details. Even have out houses. 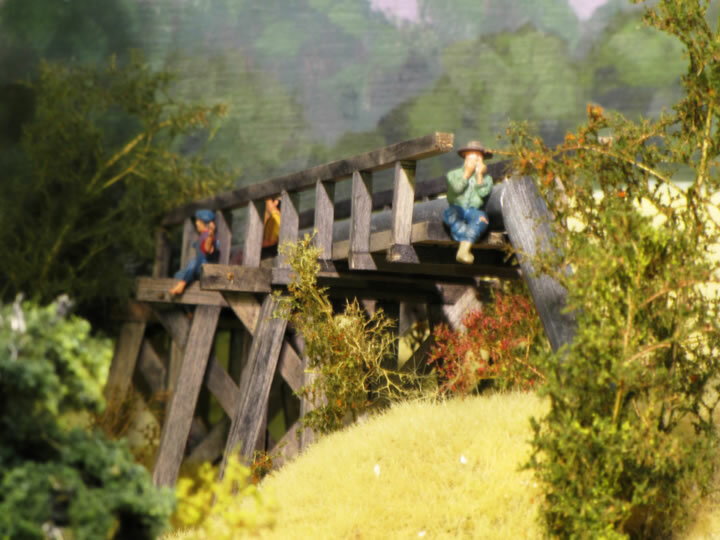 There are about 100 figures on the layout and over 150 trees. 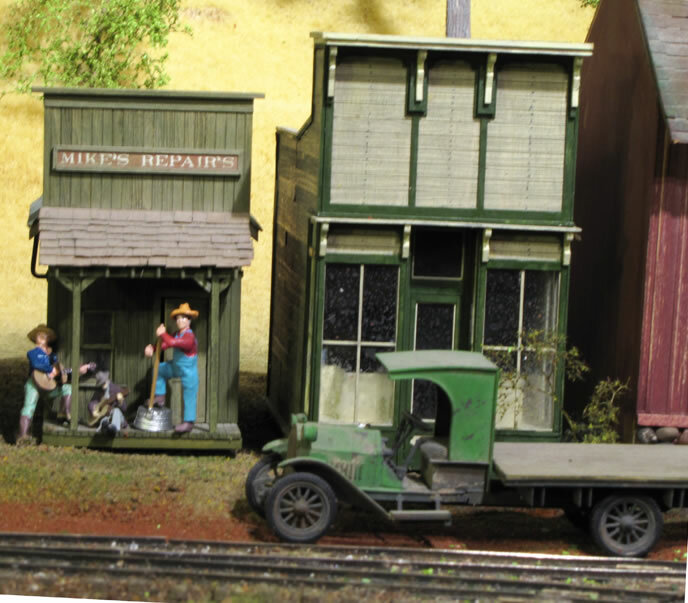 There are many cars and trucks, most are 1/48 with about 5 1/50 scale and a couple in 1/43 scale. Room is 22.5 feet by 16 feet 2 inches. 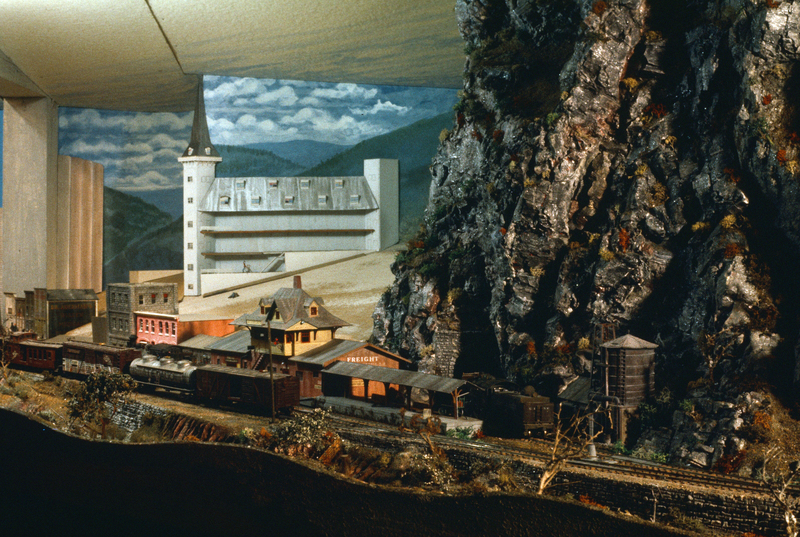 Layout is 19’ by 16’2”. Center is open. There are 2 lift outs for access. Mainly though use a topside crawler to get to areas that cannot be reached easily.